Missing Persons of America -Will more victims be found connected to the alleged killer of Mickey Shunick? Home » Archived Missing » Will more victims be found connected to the alleged killer of Mickey Shunick? Will more victims be found connected to the alleged killer of Mickey Shunick? The following is information regarding Brandon Scott Lavergne. Scroll up to read the story regarding the Missing Texas Forty. I did not originally include men in the below list, as Brandon was accused of killing two woman. BUT, as more info surfaces, I am wondering if I should have added them. Also, since writing this story Brandon plead guilty. Read the story here. Is it possible Brandon is responsible for his Uncle’s death in 1999? It is a little confusing to follow the below info, so keep in mind you may have to read it a couple of times. 🙂 AND once again, I am NOT saying that Brandon is responsible for any other killings and I am aware that he has not even had a trial yet, so he is an alleged killer. Claire Gianfala, (the woman that has been telling the media that BSL stalked her) Ellis Slocum and Kevin Atchinson were in a traffic accident on June 19, 1999 that resulted in Kevin Atchinson’s death. Kevin Atchinson was suppose to be driving per the police report. lived in, but please note that Lisa reportedly died of asphyxiation on July 3, 1999 and Kevin had died June 19, 1999. Lisa Pate, per police, was murdered by Brandon. Leander “Black” Venable is Brandon’s uncle. Black Venable, 65, was a butcher and he was found murdered in his home on March 1, 1999. I cannot find anything on this case and cannot verify it was a murder or not. Brandon Scott Lavergne, 33, of Church Point, La., was indicted Wednesday for first-degree murder of missing Michaela “Mickey” Shunick, reports USA Today. Lavergne was also indicted for the murder of Lisa Pate, 35, of Youngsville, La., who went missing in 1999. Her body was found under some large boards in a field near Church Point. The warrants for Lavergne shows Lavergne’s address as 143 Elaine Lane, Church Point and a work address of 2550 Bellechasse Hwy, Gretna, La., which is a staffing company. Note: Youngsville, La. is about 30 minutes away from Layfayette where Mickey disappeared. Church Point is about 25 minutes away from Layfayette. Although Lisa was released from jail in November 1998 in Lafayette and she was know to frequent that area and Lake Charles. in April, Lavergne married Lainey Vasseur in September 1999. Lainey left him after several assault incidences. They divorced after he went to jail in October 2000 for the assault on Parish. In February 2000, Lavergne pleaded guilty to the the battery charge of Parish and served 8 years, getting out in April of 2008. What a lot of people don’t know about Lavergne is that he has has friends and relatives in Texas, and in particular, Highland, Texas which is in Harris County. Harris County and Montgomery County are right next to each other and according to a reader when I was writing up the Missing Texas Forty article, Harris and Montgomery Counties overlap. Lavergne reported his Chevrolet Z71 pickup truck stolen from Montgomery County, Texas. He was also in the Spring, Texas (Harris/Montgomery County) to rent a car, after he abandoned his truck in Coldspring, Texas in San Jacinto County. Spring is an hour away from Coldspring. Looking at this map, Coldspring, Texas is A and B is Highlands, Texas is where is relatives live. Notice that New Caney, The Woodlands, Spring, Liberty, Conroe and Cleveland, which is a half hour a way and in the middle between Coldspring and Highlands. This also happens to be an area where there is a high number of people missing. (Click here to read about those people). 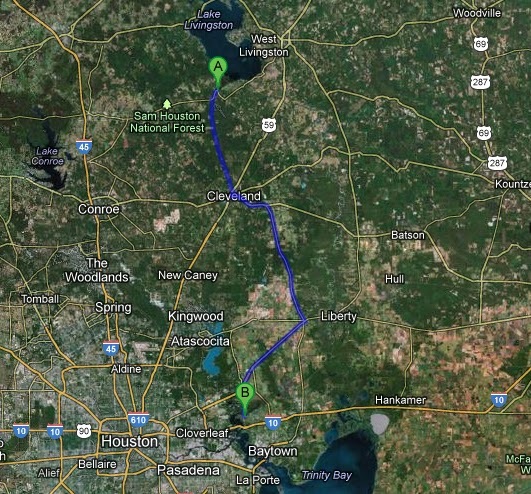 Please also note, that near Coldspring is the Sam Houston National Forest and above Coldspring is Lake Livingston. So, Lavergne rented a vehicle in Coldspring and drove it to Lafayette where he ended up buying another truck, which is were Mickey Shunick was from. Click here to read what MPofA friend and Private Investigator Mac Sanford said about the truck. So, I decided to look at my Missing Texas Forty list for any females that went missing around 1995 to 2000, which would put Lavergne around 20 years old and from April 2008, when he was let out of jail, till now. If you remember, I was searching for a common denominator for all these missing people when I originally wrote the story and what I came up with was they were all walking except for one. Not one of them has been reported on a bicycle, but Pate was not riding a bicycle and Micky was. I only listed women regardless of age. I show many missing people from this point on, but Lavergne was in jail, so I started again in May 2008. Please note that Lavergne worked as an offshore worker and those periods of time need to be taken in to account. At this time, I do not know positively his schedule, but I am theorizing it was either 7 on and 7 off or 14 on and 14 off. KATC reported he was offshore for the last two weeks, so it may be the latter. (Since then Brandon said during a police interview he was working 14). Lesa McKinley, 17, Spring, Texas, Montgomery/Harris County) 9/21/2011 (driving her car). By listing these women, I am not implying that Lavergne is responsible for their disappearance. Further research today, showed me that I was not the only one thinking this way as according to an article by the Independent, many other enforcement agencies have been contacted the Lafayette PD. And Police also told the Independent that items retrieved from Lavergne’s home after his July 5 arrest were bloodied pictures he took of himself showing the injuries he sustained May 19, and an undisclosed number of women’s IDs. One of those IDs belonged to Madeline Aumiller, 50, according to KATC. When police showed up at Lavergne’s home to search they found Madeline’s wallet with her ID along with her father’s wallet and ID. He died in 2009. Her brother verified that said she had been living with Scott Lavergne until he asked her to move out. According to her brother he realized she was missing in April 2012 and found that she had not accessed her bank account since March 2012. Madeline was from Beaumont. Lauren Spierer and Mickey Shunick story read here. For those interested, here is a link to an interrogation that the police did with Lavergne. Click here. And here is the court document. I've followed the Mickey Shunick case from day one and you've done a great job researching. Also, on March 1, 1999, Brandons uncle Leander “Black” Venable was found murdered in his home. Can you answer a question? It is rumored that Brandon had a girlfriend in Spring, Tx., who is pregnant. Is this true? What is her name – or last name if you can find it. I know he also had a fiance who had 3 children from a prior marriage, but I'm thinking the pregnant girlfriend might be able to help the investigation. Connected to the 8 murders in Jennings La? No he was prison at the time of the Jennings murders. Anyone know approximately when the truck was reported stolen or when the car rental in Spring occurred? May 26, 2012: Lavergne reports his truck stolen in Montgomery City, Texas. May 31, 2012: Lavergne picks up rental car. June 4, 2012: Lavergne returns rental car. I have checked from time to time but have not come up with anyone. The girlfriend was brought into the police station around July 12, to talk to the police. what about the jennings's murders?? i think he had something to do with that?? don't ya think thats the scumball too?????? fyi he was released in 2007 (for good behavior) he still shows as being incarcerated but if you look at his parole dates they show he paroled before he was released. So that means he was out two years and not all missing are listed. There were murders in Jennings after he was released in 2008…copycat? I still do not know who wrote this article. Don't you people at MPoA sign your work? Nice work, on not so nice a guy. Ya! Seems he is capable of anything, and no stone should be left unturned investigating other possible links to disappearances and murders. I recall a disproportionate number of murdered and missing women in Louisanna's New Orleans Parishes, thinking that there was a serial saddest on the loose. In fact there maybe several, as you have indicated by posting about McDuff. There are an extraordinary number of murdered women in Texas within a 50 mile radius in the early 2000's there were as many women missing/murdered women. The case is which I have searched to no avail, as there are no leads, are the three young women who disappeared just before Christmas 1973 from a shopping centre. They were seen getting into a van in the carport of the shopping Centre, with two men. (They would not have gone willingly, the persons had to have had a gun) Very young women just randomly doing their last minute Christmas shopping. Thanks. Wish he would reveal names or the police would reveal names from the women's IDs they found with Lavergne. I wrote Lavergne and he told me some interesting things in the letters I got from him. I turned copies over to LE. Especially about the other truck he saw…. I bet that was interesting. I think he is responsible for many more missing women but we will never know.